This is set a year after the events of the original film, when Carl Kolchak (Darren McGavin - ) was fired from his job as an investigate reporter at a newspaper in Las vegas. Now he is in Seattle, where he bumps into his former boss Tony Vincenzo who re-hires him and makes him the star reporter at the local Seattle newspaper. 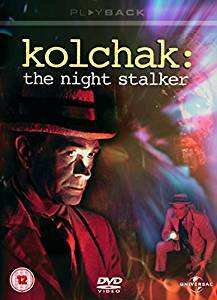 Kolchak's first job is to cover the unusual murder of a young woman. He discovers a historical pattern. There were six murders in an eighteen-day period every twenty-one years, and the pattern started over a hundred years ago. This idea of a supernatural killer exposed by his recurring pattern occurred earlier, in one of Matheson's previous works - Star Trek TOS: A Wolf In The Fold . However, this is the TV show that inspired Chris Carter to create The X-Files - a show based around the idea of such patterns being detected by the FBI Cold Case squad. There is a token woman in the cast. She is JoAnn Pflug , one of the killer's potential victims who works as a belly dancer in order to pay her way through college. Kolchak wants her as a love interest, even though she is probably half his age. In all fairness, the actress was in her early thirties at the time. Anyway, Kolchak settles for using her as bait to lure the killer out. Finally, Kolchak investigates Dr Richard Malcolm (Richard Anderson - Six Million Dollar Man ). Unfortunately this actor does not get very many scenes, but he makes the most of the ones that he has. The film tries to make use of the Seattle setting. For example, there are referential shots of landmarks like the monorail, the Space Needle and the Seattle Underground. However, this appears to have been filmed on a sound stage in Los Angeles rather than at real locations. For example, the climax takes place in a version of the Seattle Underground that is very different from the real-life location. It seems to have been the inspiration for the Undercity in the Judge Dredd comic-book stories, which itself seems to have inspired the Old New York of Futurama . The ending is a setup for the full series. Since the show is set in Chicago, it is obvious that Kolchak and Vincenzo will not be stuck in Seattle for long. The only surprises are that they set out together for New York, and that they take the love interest along for the ride. Night Stalker (1974) [Season 1, Episode 12] Mr. R.I.N.G.